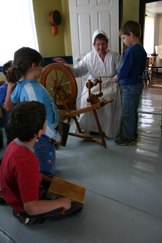 Here at Ross Farm we offer hands-on programs in the various buildings on site and general tours to all school grades. Our hands-on program allows students to learn and experience traditional skills first hand that were once used daily many years ago. Our knowledgeable and friendly staff explain the importance of the skill they are teaching and insure a safe working atmosphere for the children. School bookings are available from January - March and May - October.